It seems like just the other day that we were telling you about our collaboration with 826 Valencia, a non-profit writing center founded in San Francisco that offers, among other things, free tutoring and writing workshops to students ages 6-18. Now we’re excited to tell you about a new collaboration—this time, with McSweeney’s Publishing. McSweeney’s is an independent publishing house that was founded by author Dave Eggers, who is also the co-founder of 826 Valencia. (You can listen to Dave Eggers talk about 826 Valencia, their mission, and their connection to McSweeney’s in his 2008 TED talk.) Just like 826 Valencia, McSweeney’s is one of our neighbors in the Mission, and when they asked us to contribute to their annual holiday party, we were happy to oblige! In celebration of new December publications by McSweeney’s, which include Lucky Peach issue 5 (a journal dedicated to food and writing), Timothy McSweeney’s Quarterly Concern issue 42 (an award-winning literary journal) and Beck’s Song Reader (Beck’s newest music album), McSweeney’s is hosting a holiday bash on Thursday, December 6 from 7-10 pm, at the Makeout Room in San Francisco. They’ll have a live reading by author Paul Legault, whose newest collection, The Emily Dickinson Reader, was recently published by McSweeney’s. The reading will be followed by karaoke and dancing. There will be free holiday treats to enjoy, including our chocolate! McSweeney’s has been kind enough to provide us with a limited number of complimentary tickets to the event, as well as gratis subscriptions to Lucky Peach magazine. We’ll be giving these away at our retail space with the purchase of $40 worth of chocolate starting this Friday, November 30. Here’s the catch: You’ll get first dibs on your choice of either option (a pair of tickets or a year-long subscription to Lucky Peach) if you (1), include a copy of our 826 bundle in your purchase, or (2), casually mention to us how much you enjoy karaoke. So whether you’re a McSweeney’s enthusiast, a Lucky Peach reader, or just a chocolate lover looking for a good time, please consider stopping by our space to get some holiday shopping done and receive some McSweeney’s goodies while you’re at it! 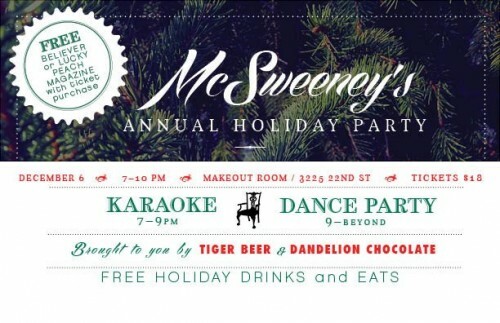 You can find a link to the McSweeney’s holiday party here. In addition to our free ticket giveaway, tickets to the event can be purchased here. For more information on all things McSweeney’s-related, please click here.